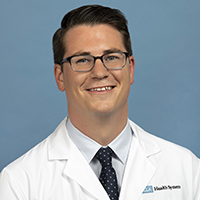 Dr. William Carroll is an internist who practices both traditional primary care and complex medical care for the UCLA Health Extensivist Program in Westwood. He is board certified in internal medicine, and uses evidence-based methods and a multidisciplinary team approach to improve health outcomes for patients. Dr. Carroll received his medical degree from St. George’s University. He completed his internship and residency training in internal medicine at New York’s Stony Brook University Hospital, where he went on to complete his chief medical residency. He received his undergraduate degree from McGill University in Montreal, Canada. Outside of the clinic, Dr. Carroll engages in clinical research on how to improve the quality and safety of opioid prescription for the use of non-cancer related pain. He also conducts research on how to improve the way that social determinants of health are addressed in patient populations. He is a strong advocate for improving patient care and graduate medical education in the David Geffen school of Medicine and UCLA. He continues to advocate for improvements in our health care system while working with the American College of Physicians and the American Medical Association.